Last Saturday my "irregular" Jakarta opponent and I played FOW for the afternoon. Chun Long hails from Singapore and had recently brought over scenery and fresh tanks. 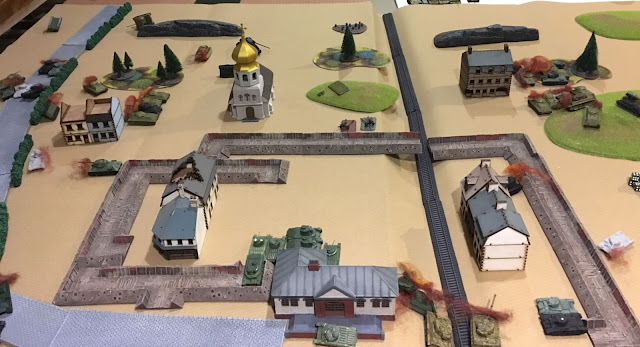 We played a scenario based on the battle of Kursk, 1943 - I took the Germans and Chun Long the Russians. The objective was a railway station at the centre of the Russian base edge. 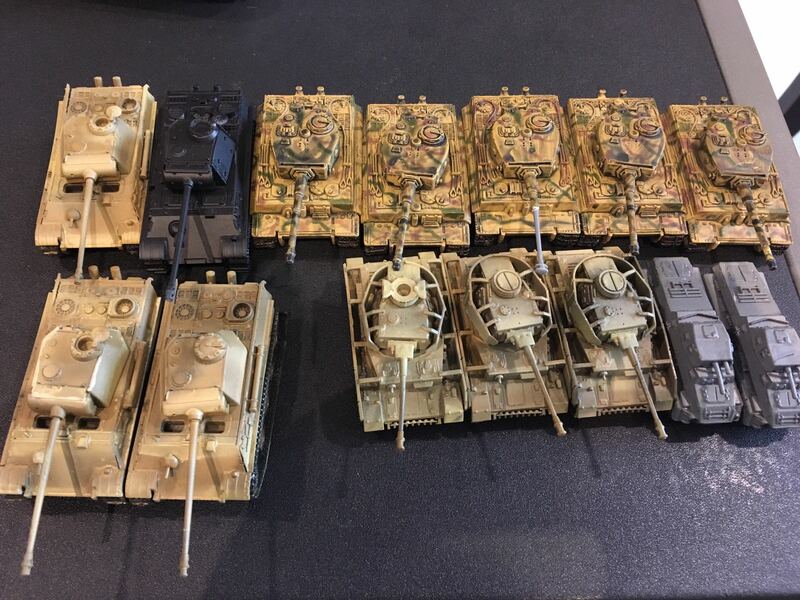 Chun Long started with his ATG dug in on table, his tanks arrived in turn 1. I deployed the Tigers to my left, the Panther team to my right. My initial move was to send my Recce up the road, followed by the Panthers, whilst my Pz IVs stayed on a hill to give support. Meanwhile my Tigers advanced menacingly & ponderously towards the Soviet defences. 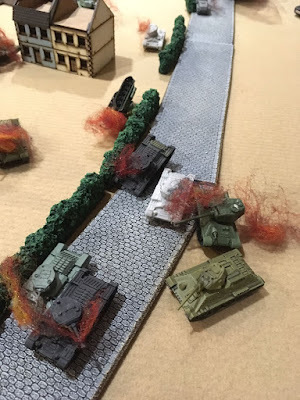 My Recce unit got hit, took casualties & retreated off table, but had stopped the Soviets using the road. The Tigers traded shots with the ATG – Disaster! 1 platoon failed its morale test & retreated off table. 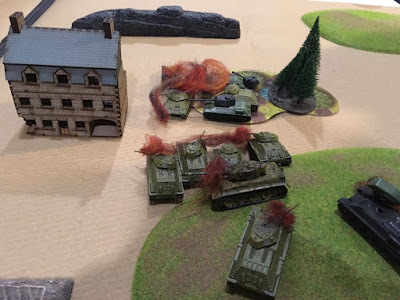 The remaining 3 Tigers then set about demolishing the oncoming waves of Russians, whilst on the right the Panthers advanced, halted & retired slowly, their path marked by burning Russian tanks. The Pz IVs took a hit and retreated off table, the Panthers likewise a couple of turns later. The ones that "got away". The 2 Tigers only fired 1 or 2 shots ! The Tigers continued to shoot/reload/advance to the railway station. 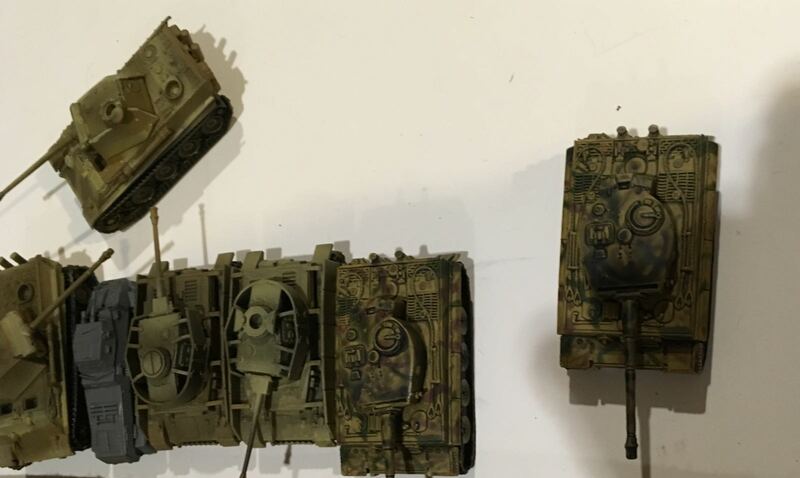 88mm Ammo was getting low, as were Russian stocks of spare tanks & smoke markers. 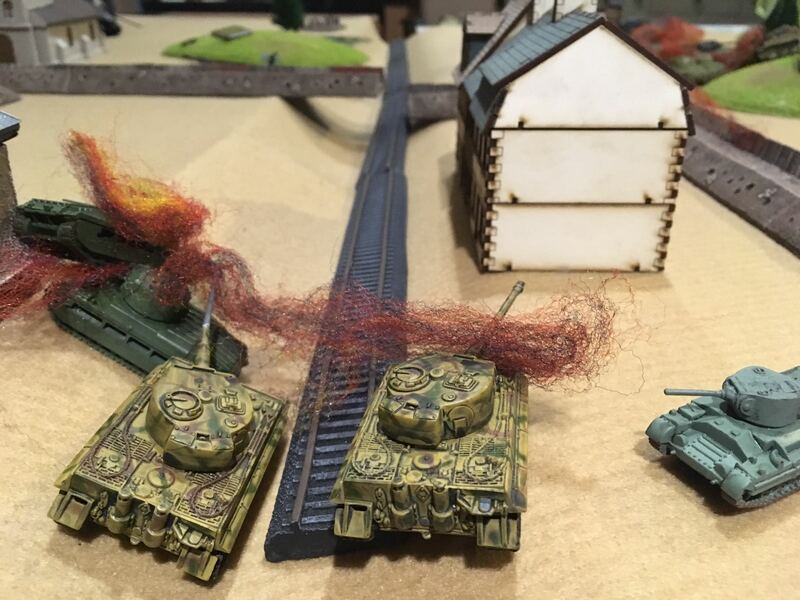 One Tiger died on a hill, the remaining pair made it to the station and took turns to destroy tanks and ATG at will. In the end both Tigers succumbed to mass ATG fire, but having destroyed nearly every tank sent against them. I was still within a whisker of a win. The Tigers were superb, with Soviet shot bouncing off or ineffectual. Chun Long scoured the rulebook but could not find the “for the Rodina!” ram rule! It was a thoroughly enjoyable and well fought game (…..and I lost).